Also known as Wright's Golden Membrane Weed. 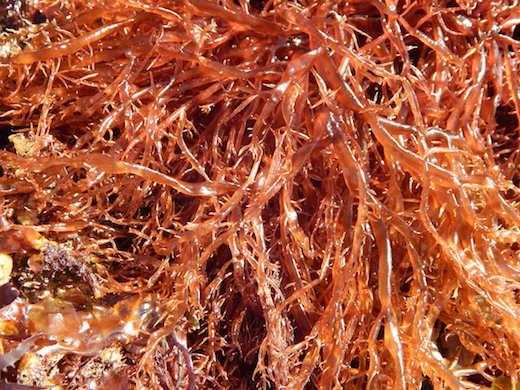 Description: Soft, gelatinous, compressed, red to brown-red fronds, to 400 mm long, filled with a watery mucilage and with small gland cells borne on inflated basal cells. Main axis simple, not jointed, without nodal diaphragms, not constricted. Very variable in branching pattern, 2-4 times branched (alternate, opposite or irregular) with branches constricted at the base and tapering at the tips; fronds often with many small proliferations. Alien species originally described from Hokkaido, Japan. 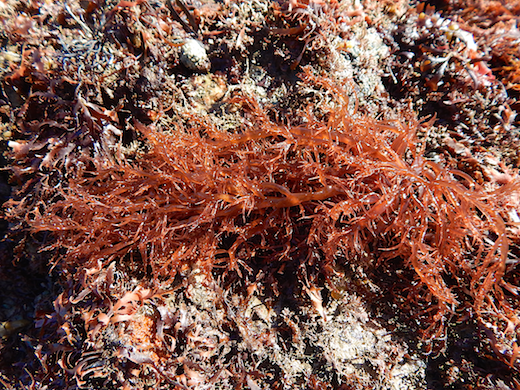 It was first found in the Étang de Thau in 1978, a "hotspot of introductions." Plants were found on marinas in Falmouth, Cornwall in September 2013 by Francis Bunker. Habitat: On marinas, rocks in the lower intertidal and in pools; subtidal to 14 m (NW Spain). Currently restricted to SW Britain, NW Spain and Mediterranean France. In its native range it occurs from the Russian Far East and Japan, south to Korea and China. Similar species: Lomentaria clavellosa, which is more regularly branched and forms tetrasporangia in disctinct sori rather than scattered in the cortical layer. Photographs © David Fenwick. Falmouth Dock, Cornwall. Site © M.D. Guiry 2000 - 2019. Important copyright notice: all text, design and photographs on this site are copyrighted by M.D. Guiry unless otherwise stated and all rights are strictly reserved. Click here for copyright information and contact. Website design: 249 Design Studio. Site maintained by M.D. Guiry (michael.guiry@nuigalway.ie). There have been 8736595 page loads since 1 January 2014 on 25 April 2019.